A recent RTÉ poll identified Seamus Heaney’s sonnet, “When all the others were away at Mass,” as Ireland’s favorite poem of the last hundred years. The sonnet, published in 1987, comes from “Clearances In Memoriam M.K.H., 1911-1984,” a sequence Heaney composed on the death of his mother. In ‘When all the others were away at Mass,’ Heaney recalls an intimate moment between mother and son spent quietly peeling potatoes. This memory resurfaces as a kind of prayer while his mother is on her deathbed. A small jury selected a shortlist of poems from public nominations and, in turn, invited the public to vote on their favorite from the final ten. Other poems on the shortlist included works by Patrick Kavanagh, Derek Mahon, and Louis MacNeice. The poll, dubbed “A Poem for Ireland,” was intended to highlight Ireland’s 20th and 21st century poetry and raise awareness for the country’s long-standing literary traditions, where the chosen work would not simply be a favorite, but serve as a literary representation of the Irish. “The thousands of thoughtful and considered responses from the public to the initial call for nominations and to the ten shortlisted poems is clear evidence of just how much poetry means to us as a people,” RTÉ television’s managing director Glen Killane told The Irish Times. Heaney’s poem brings to mind not only the loss of a parent, but the too-recent loss of the poet himself. Although the Nobel laureate passed in 2013, his legacy is already firmly cemented in the Irish literary tradition as one of the best. Already construction is underway on a visitor center in Heaney’s native Bellaghy, County Londonderry, that will not only celebrate the poet’s life and work, but also serve as an educational and performance center. 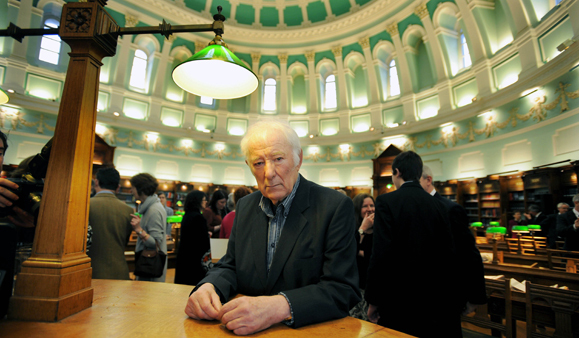 Last Fall, Poetry Ireland Review published a special Heaney tribute issue. “He was our best poet, by a country mile,” poet Vona Groarke wrote in the introduction. Fifty young poets were invited to share their favorite Heaney poem along with a short essay on their selection – there was fascinatingly little overlap between the selections. That 46 distinct poems appeared in the sold-out issue illustrates how in Heaney’s incredible body of work, there is truly something different for everyone. “Is there another poet for whom the same claim could be made?” Groarke asked.